FORTUNATE OUTCOME: Judith Mullen, 76, of Darlington, is loaded onto a stretcher after her 1995 Cadillac DTS caromed down N. Lebanon Street before coming to a stop in front of Goody's. 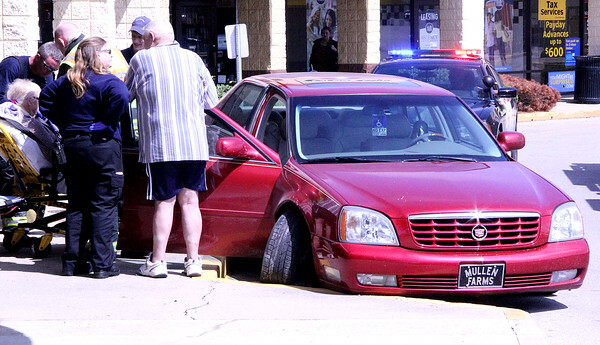 The vehicle mounted the sidewalk before striking the curb. Lebanon Police officer T.J. Nelson said the passenger, Donald Mullen, turned the ignition key off headinng south on SR 39 after he saw a "blank look" come across Judith's face. Donald then grabbed the wheel from th epassenger seat and steered the car down N. Lebanon St. before crashing into the curb and snapping the drive shaft of the right front wheel. Nelson said the incident could've been much worse had one of the pedestrians on the sidewalk been struck.